Your body produces uric acid when it breaks down substances in food called purines. Normally, the body is able to effectively process and eliminate uric acid. But sometimes uric acid builds up, or the kidneys are not able to get rid of enough uric acid, which results in excess levels in the blood. Hyperuricemia can also result from eating too many purine-rich foods, according to an article published by the Arthritis Foundation. If your doctor has advised you to follow a purine-restricted diet, certain foods, such as liver and anchovies, will be off the menu. Nuts, on the other hand, are low-purine foods that you can continue to enjoy. When your body isn't able to process and eliminate enough uric acid, it can make you sick. High uric acid levels can lead to gout, a form of inflammatory arthritis that's caused by deposits of uric acid crystals in the joints and leads to pain, stiffness and swelling. Uric acid is also strongly associated with metabolic syndrome, a cluster of risk factors that increase your chances of developing diabetes. According to a study published in 2017 by PLoS One, high levels of uric acid are associated with the development of Type 2 diabetes. All tree nuts and peanuts are low in purines. Low-purine foods are those that contain less than 50 milligrams of purines per serving. The standard serving size for nuts is about 1 ounce. A 1-ounce serving of peanuts contains 22 milligrams of purines, whereas the same size serving of almonds provides 10 milligrams of purines. An ounce of walnuts contains only 7 milligrams of purines. Even eating two servings of nuts in one sitting would not be enough to qualify them as a moderate-purine food. Eating a diet rich in nuts will not raise your uric acid levels because nuts are not high in uric acid. In fact, adding almonds to your diet may lower your uric acid levels, according to a study published in 2015 in the Nutrition Journal. 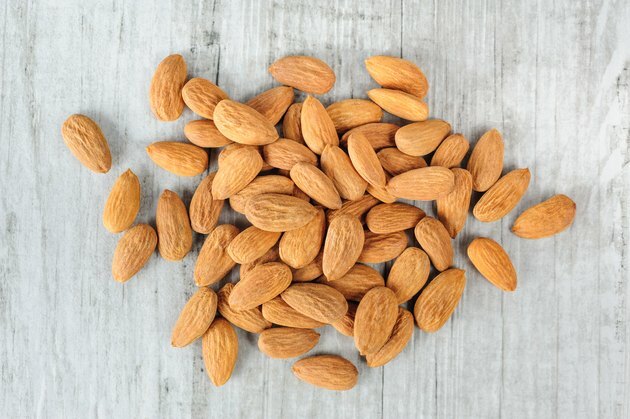 This study was carried out on participants who were suffering from coronary artery disease, and the participants ate 10 grams of almonds before breakfast every day for 12 weeks. The researchers noted that although the study was conducted on people with coronary artery disease, the results would have been the same with healthy participants. Keep in mind that nuts are rich in calories, so eating too many could cause you to gain weight. Being overweight or obese is a risk factor for both gout and diabetes. Seafood and organ meats are the foods that are highest in purines. If you're afraid of gout, limit these foods in your diet. As an example, canned sardines contain 399 milligrams of purines per 3.5 ounces, and chicken liver has 243 milligrams of purine in a 3.5-ounce serving. You should also avoid eating game meats, meat gravies and yeast. Arthritis Foundation: What Role Does Diet Play in Gout Management?